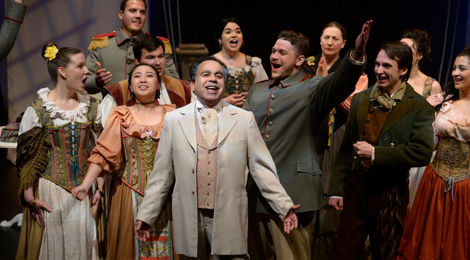 Toronto Operetta Theatre has immeasurably broadened the palette of music theatre in Toronto by its presentation of zarzuelas, the Spanish form of operetta. Currently the TOT is presenting the Canadian premiere of the 1923 zarzuela Los Gavilanes (The Sparrow Hawks) by Jacinto Guerrero (1895-1951). This will be the sixth complete zarzuela that TOT artistic director Guillermo Silva-Marin has introduced to Toronto since 2003. Not only does Los Gavilanes have one of the most beautiful scores in the genre, but it provides Silva-Marin an ideal role for a triumphant return to the stage. The action is set near a Provençal fishing village in 1845. Juan (Guillermo Silva-Marin), now aged 50 has returned to his home village after having made his fortune in Peru. He had been been in love with Adriana (Miriam Khalil) but Adriana’s mother Doña Leontina (Rosalind McArthur) opposed the marriage because of Juan’s poverty. Juan therefore left Spain hoping to make enough money to marry his beloved Adriana. But, on his return, but he finds that in his absence Adriana had married, had a daughter, Rosaura (Sarah Forestieri) and is now a widow. Under pressure from Doña Leontina to save her family, Juan vows to marry Rosaura much to the anger of the village and of Rosaura's beloved Gustavo (Ernesto Ramírez). The chorus sings that he is like a sparrow hawk preying on a defenceless dove. The libretto by José Ramos Martín shows the similarities and differences between zarzuelas and the operettas of the rest of Europe. Golden Age operetta in France, Austria and England began as primarily a vehicle for satire. In operetta’s Silver Age, especially in works by Messager, Lehár and Novello, romance became the dominant theme. There are satirical and allegorical zarzuelas, but romance has always been the dominant theme from the beginning. While operetta in the rest of Europe concerned itself with the love affairs aristocrats and celebrities, zarzuelas always were a kind of opera of the people (or “drama lírico popular” in the words of composer Pablo Sorozábal) and did not shy away from depictions of poverty and life decisions determined by need. This is especially the case in Los Gavilanes, where marriage for money rather than love has ruined the lives of Juan and Adriana and threatens to ruin the lives of Rosaura and Gustavo. Although there is the remnant of satire in the competition between the mayor Clariván (Gregory Finney) and the army lieutenant Triquet (Diego Catalá) for prestige, the work, unlike a typical operetta, is far more preoccupied with the pain that the four principal characters have suffered and whether that pain can ever be healed. The result is that Los Gavilanes covers more serious territory than is usual in operetta. As a consequence Guerrero’s music rises to the occasion and he has not written songs for the main characters but rather full-blown operatic arias. The score is filled with one gorgeous melody after another and I’m sure that many people will seek out a recording of the work as soon as they can. 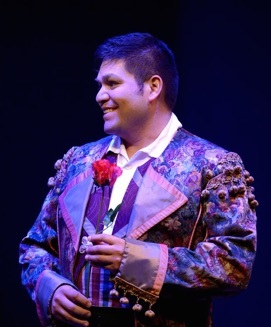 While Guerrero uses typically Spanish dance rhythms, especially for the chorus, his arias show the influence of both Puccini and Lehár while maintaining his own individuality. standard repertory for older tenors. Silva-Marin has kept his voice in shape and dispatches the many stirring arias Guerrero has written for Juan with beauty and passion. It is a great role with an emotional arc passing from the joy of his entry song “¡Mi aldea!” to anger and remorse and Silva-Marin is more than equal to its demands. 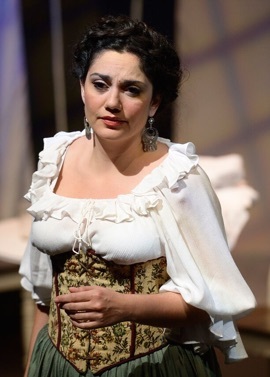 The zarzuela also affords the chance to hear the sumptuous voice of mezzo-soprano Miriam Khalil as Adriana. Khalil’s acting and singing bring out the complexity of a character whose life was ruined by her mother and who wants to prevent her mother from ruining her granddaughter’s life too. The love for Juan that she has hidden from Rosaura and from herself comes pouring out in the exquisite Act 3 aria "Para siempre murió mi ilusión”. A third superb performance comes from Ernest Ramírez as Gustavo. Ramírez colours his large Italianate tenor to bring out the emotion of every aria he has. Loveliest of all is his Act 2 romanza “Flor roja”, said to be one of the most perfect tenor arias in all zarzuela. When one hears the beauty of such arias as this one can only wonder at the foolishness of the non-Hispanic world in leaving the richness of zarzuela unexplored for so long. As Rosaura, Sarah Forestieri has a deceptively delicate soprano that nevertheless fills the hall. Gregory Finney and Diego Catalá provide an almost Gilbertian form of comic relief to the serious main plot in their satire of governmental and military pomposity. in the present production. The second missing piece of information is that after renouncing Rosaura for himself, Juan gives her a dowry to marry Gustavo. This also would elevate Juan in our opinion and would give added impetus to the ensuing celebration of friendship in the march “Amistad, amistad”. Silva-Marin, who has also done the lighting design, leaves spotlights on Adriana and Juan for a moment after the finale. By this means he points out an avenue that the librettist could have explored but does not – namely a reconciliation between Juan and Adriana – but suggests that this is where the story will go after the celebration for the newlyweds. It’s a subtle directorial gesture but it goes a long way to rounding out the story. The orchestra led by Larry Beckwith plays a delightfully inventive modern reduction of the score that plays with unusual combinations of instruments and makes the most of the inclusion of a guitar and of various percussion instruments associated with Spanish and Latin American music. Particularly effective is the use of guitar and string quartet to accompany "Para siempre murió mi ilusión”. Once again the TOT deserves the gratitude of Torontonians for opening the window a little wider on a cultural world we know far too little about. When you hear the beauty of Guerrero’s music in Los Gavilanes, you are filled with two feelings. On the one hand, you wish that this weren’t the first time you are hearing it. On the other, you are glad that at least now you are and, better yet, in the context of a live production. If you add that to the opportunity to see Silva-Marin himself on stage in a ideal role, not to mention the fine work by the rest of cast, you have at least two overwhelming reasons to expand your cultural and musical horizons. Photos: (from top) Guillermo Silva-Marin as Juan with the TOT Chorus; Miriam Khalil as Adriana; Ernesto Ramírez as Gustavo. ©2016 Gary Beechey.